I haven't posted much this summer as quite honestly there wasn't really a whole lot of interesting finds at the garage sales. Sure I got a few CDs here, a couple games there, but nothing overly impressive to be had. This weekend though at a rummage sale someone donated a bunch of not crappy LPs which really excited me! Of course most of it I didn't want or I already own, but there were some rather harder to get ones that I probably didn't already have in my collection. 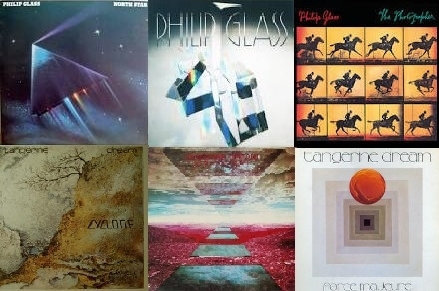 3 Phillip Glass and 3 Tangerine Dream ones. It's hard to recall as if I do have them or not as it's probably been some 20 years since I've seen them last. They were all ones that tend to sit on my shelf rather than get huge play. Tomita, Vangelis and Larry Fast are other such examples. I have lots of those "New Age" LPs but I've just never been in the mood to play them very much as they tend to be quite dull and I need something with a bit more bite to them. And with all those artists, there is no telling what you'll be getting until you play it, it could be awful or very good. I'm pretty sure I have North Star when I played it yesterday as I knew it all quite well. I think I have the CD but it's another that I probably have not played in at least 10 years. Yet I swore I had Glass Works as well but I didn't know it at all while it was playing, so I'm glad I bought them both instead of putting them back as I had planned to do. The Photographer I knew that I don't have (or at least never got around to playing if I do have a copy). The Photographer was a bit different than the other two but still quite enjoyable. With Glass most of his stuff is the same thing just redone ever so differently but so far I love it all. I just cannot play it for very long as it gets very tedious, like playing the same 3 minute song all day long. Tangerine Dream is harder to say. I may have bought the from my friend Tim many years ago but never got around to playing them. They tend to be hit or miss, dull/awful or quite good. Played Stratosphere and it's not very good at all. Now I'm playing Cyclone and it is quite good. I think I probably like their name and reputation more than the music themselves. I know I love their Tyger LP lots, but thats about 10 years after these and it's one that fans tend to dislike, but then again by the time that one was released it was the start of when they decided to do few dozen albums a year. You pretty much have to test before you buy with anything they release. I bought these mostly because the covers were in NM condition and I knew the ones I got from Tim were well loved. I think this may have been the first time I've ever seen Tangerine Dream LPs in the wild that wasn't in such horrible condition and not marked up for over $10 each by some dealer, so I had to pick them up for $1 each no matter what. The last one I got was a total random that I looked up on ebay and someone called it prog, which was enough for me to buy it. Of course when I got it home, it wasn't really prog. I see now that another listing says it's "FUNK POP" and that's more like it. Wiki said that they were quite biting and satirical at the time and I believe so. They are quite like 10cc or Sparks and how they are considered prog mostly for the same reasons rather than their music sounding anything progressive. Anyway, it's all in Russian! Well, the cover is in dual language and I think it's also in Estonian for those that cannot read Russian? Of course being in another language doesn't stop me from enjoying music. 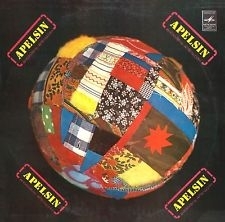 Apelsin means orange in their language. This one seems to be their second LP. Wiki seems to believe that they are all self titled (some 5 of them) and denotes them by year. I see it's really "???????? · ????????" (you'll need special Russian fonts to see this I bet) which translates to "Ensemble - Orange". Sadly the jokes are lost on me. There was an interesting parody of a Christmas classic which is probably quite witty as well as a cover to a Merle Haggard tune that I don't know. Another song mentioned a lot of classical composers which I really would like to know what they had to say about them as I'm sure it was quite interesting/funny. And about three of the songs were very much in the disco funk almost prog sounds that several minor bands were doing around the late 70s. I very much liked those as that's probably my favorite sort of 70s prog music. Actually the LP as a whole sounds more like a Japanese rock one from the same time period than anything else. Basically outdated B-music (close to AOR) that is derivative of what was popular only a few years ago. The secondary countries were always a few steps behind with their music (I heard it was because of music banning and other limitations) but they seem to do quite a bit of magic with what they got and made it far more interesting than it deserved to be. I consider that magic as progressive music myself, to take old dated sounds and make it interesting and inventive. It's a bit like how the Beach Boys (Brian Wilson actually) progressed dated surf rock with Pet Sounds. Anyway I don't regret buying this one at all but I sure do wish I had a translation as I'm pretty sure my experience would be greatly enhanced by knowing what they had to say.